My dad and I went turkey hunting in the woods surrounding our home yesterday. We didn't see any turkeys only turkey poop. Fortunately I did bring my camera and take some nice pictures. I think these flowers are some kind of wild clematis but I am not certain. I do know this is shooting star. 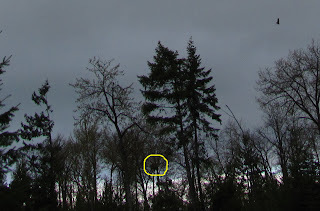 We spied a bald eagle's nest which was really exciting for me since I had never seen one before. 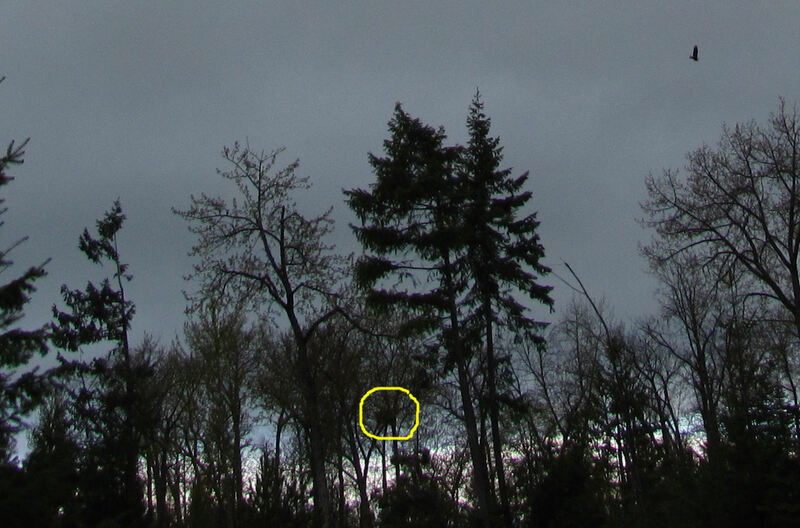 I panned out on this shot and marked the nest with a circle. You can see one of the eagles, too. Also, we saw 6 elk but they wouldn't stop to get their picture taken. How nice to see so much wildlife (I love the eagle nest. I have never seen one either). Here we are lucky to see some duck and geese in the woods, though one time we did see a deer and once an armadillo had three babies right near the woods path and we got to watch them grow. Nothing as cool as elk and eagles, lol. I would love to see an armadillo! You never know what you will see walking around here, it's a lot of fun. I'm Breaking Out in Hives!